Purpose: The purpose of the Outstanding Support of Military Children in North Carolina Recognition Program is to recognize clubs/groups who demonstrates an exceptional commitment by developing and implementing innovative programs, positive opportunities and additional resources for military families and their children within their communities and across North Carolina over the past year. 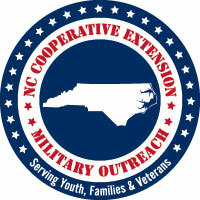 The North Carolina Cooperative Extension Military Outreach program sponsors the statewide recognition program to acknowledge the outstanding work of clubs/groups who give their time, talent and resources in support of North Carolina’s military children, families and veterans. Nominations: Nominations may be submitted by 4-H Volunteers, 4-H Agents, County and District Extension Directors, and NCSU Faculty. 13 May 2015 All nominations for recognition must be in the state 4-H office at 5:00 p.m. (recognizing outstanding support from 1 October 2013 through 30 September 2014). 1 June 2015 Notification of county of award winners. 19 July 2015 Presentation of awards at the North Carolina 4-H State Congress.